Ambush. Blessing. I’m not sure these two words naturally fit together at all! But I am living proof of the above…I will explain!Thailand is a spectacular country; boasting magnificent temples around every corner. Religion and faith come hand in hand in this country and the people are full of optimism, happiness and peace. 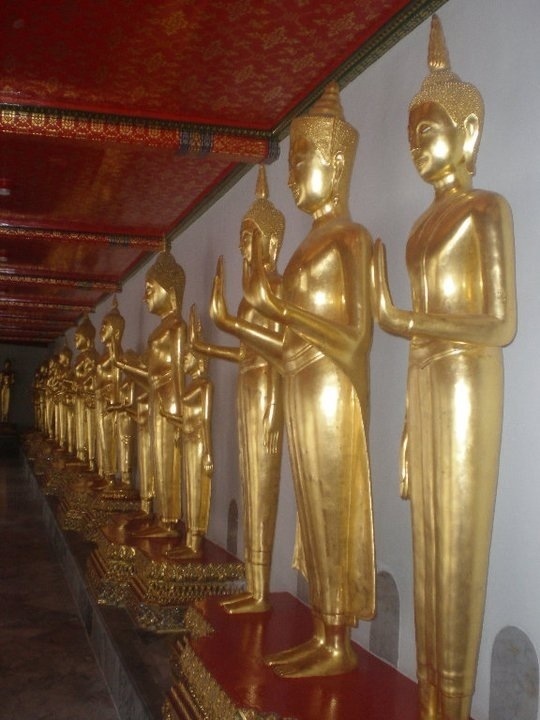 Almost every tourist will visit the temples whilst in Thailand, especially in Bangkok; where the serenity inside the glorious temples offers complete contrast to the hustle and bustle of the city outside. One sweaty and humid afternoon I escaped the busy Bangkok life for a few minutes in exchange for a look around a temple. Although I am not a Buddhist, I do really like this religion, I love the peace. Stepping into the temples is like stepping out of your ordinary life onto a soft floating cloud. A kind of utopian euphoria sets in, all of a sudden my mind is emptied and any worries I may have are long forgotten. Sat there my meditative state, I was half aware that there was a monk on the otherside of the room, along with a small gathering of religious followers. However I didn’t take much notice… Until I got soaked that was!! The monk was blessing the crowd before him; he said Thai prayers, followed by splashing water on their heads with a large, white flower. And all of a sudden I seemed to become involved! Surprised, and slightly startled to have water on my head, my immediate reaction was too laugh! Now I know this is probably rather disrespectful, but wouldn’t it make u giggle having water fly across the room via a flower and landing in your head completely unexpected?! Once I had overcome the initial shock however, I felt wonderfully blessed. It was such a magical experience, and it made me feel really quite special. I went into the temple as a tourist, and I came out as a blessed person, at total peace with the world. I am not claiming by any means to be an expert on the Buddhist religion, but I do think that they have many principles and ways of life that the rest of us could learn from. They appreciate the beauty if the world, look at life with a positive attitude, and see the light in any dark. I think this is a wonderful way to live, and since this experience, along with several others in Asia, I have tried to implement a little bit of this approach into my own life… And so far it has worked very well for me. You only live once, so focus on the wonderful things that this world has to offer, rather than the negatives. Hayley is a globtrotter and World traveler, who shares her experiences on her blog - Life as a Butterfly. Do you also think that Buddhism is one of the greatest religions? Have you ever had any experiences with the Buddhist celebrations and traditions? Don't be shy! Leave a comment!